Arthur Stone, back in 1939, was trimming American paper to fit into a British binder. He started playing with the long thin strips, finding the first flexagon. I met them through Martin Gardner, not in 1956 when he first wrote about them, but while at university in the early 70s. The link here should take you to what Gardner wrote, updated relatively recently. I re-read it only after I’d finished writing most of this, so any overlap is common material, not plagiarism. His article is a good deal longer than mine. There are some videos on youtube, which I have shown in class, but they didn’t stimulate the kids, though they did support what I’d said. I found that the points of confusion remained exactly the same, unimproved by video before or after. General comment made was that the authors hadn’t admitted there were any problems to overcome. Others have had different reactions. Take a strip of paper with parallel sides. I found that a sheet of A3 will give several (eight to ten) strips of the width of a school ruler and that this combined length of strip is about right. Fold the strip so that equilateral triangles appear between the folds. One way to do this at school is to use the 60º angle of the appropriate set-square to make a first flap. Then fold each new fold to a long edge so as to perpetuate equilateral triangles. It is worth doing this s l o w l y; you want each pair of creases to meet at the edge (or very nearly so), so wrapping the strip around itself is not good, as the increasing thickness of the wrap moves the creases away from where you want them. It is also quite a good idea (but not necessary) to make all creases work in both directions. Precision is good at this point. You want 19 triangles. An alternative folding method would be to wrap a ruler at the ‘right' angle quickly for one set of folds and build the intervening set at a second wrap. I suspect this was Tuckerman’s method, though again, I’ve thought of it too, not copied soeone else..
For classwork, this folding takes some students so long that the next activity for the quick is to colour their paper strip. Most students prefer to colour every sixth triangle the same way. Some prefer every third. Many felt pens put the ink through the paper, which spoils the previous work. More girls than boys do the whole process right, but the few boys that do it well match the best girls. The slower students can do their colouring later. 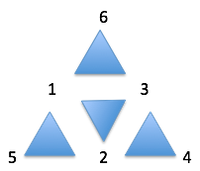 Leave the 19th triangle blank and the reverse of the first triangle blank. Best practice is to squiggle in pencil on these two, as they will be glued together. Fold your strip in the same direction in a twisting motion that halves the length and makes nine triangles each of double paper thickness. If initially the triangles were numbered 1 to 19, with 1 and 19 ‘point up’ then the ‘point up’ ones at the start were the odd numbers (obviously). After the first folding action, with No1 point down, the ‘point up’ numbers are multiples of 4, with the reverse of 19 on the end. Working with kids, check that at this moment that there really are nine (double) triangles and enough (if not a whole 19th triangle, enough) left over to make a join. The next move continues twisting in the same direction (anything else unravels), so that the visible faces are 3n-2, n>0, i.e. 1,4,7,10,13,17. Tuck No17 behind No1 and the face of No19 tucks immediately behind No 1. Stick these together; in theory at least that should stick the two blank faces (the ones with squiggles) together. If you prefer to use sticky tape, then it needs to start on the back bottom edge of 19 and it finishes on the front bottom edge of No1. This is the bit that goes wrong (mostly because the kids didn’t count carefully enough) so a dryish glue (Prittstick and similar) works best. Tape tends to spoil the finish. What you now have is a hexagon of six identical triangles. Kids that rush to flex tend to mess up and need rescuing, so patience is a virtue at this moment. Choose one complete diagonal joint. Push the joint up on your left and down on your right. This forms the chosen joint into a Y or T with the stem on your left. With your right thumb see if the top right fold will pull out to the right. Let us call this move a flex. Do not force it. When you’re sure it should flex (later on) you can use the opportunity while it is in the folded Y/T shape to manipulate the folds to advantage – pressing them firmly into shape. I noticed that when doing the small motion of pulling the top fold with the thumb, long fingernails tend to spoil the paper; use the pad of the thumb, not a nail. Let’s assume you had your left thumb on triangle No4 and the forefinger on No1. After one flex you have in front of you a side you haven’t numbered. Turn the hexaflexagon over and put your left thumb on No1; flex exactly as before and you have a side made up of sides numbered 3n-1; Leaving your left fingers on one number higher than before, flex again and now the two signal triangles are 3 and 6 [1/4 became 2/5 then 3/6]. A fourth flex is not possible, so rotate clockwise (it rotates clockwise in your hands) so that the left thumb goes on No3 and one flex is possible. You will find that the number of possible flexes for each new rotated position alternates between three and one. There are an amazing six different faces. My numbering may not match yours, but the pattern will match; triangle numbering differs by three on each face and flexes go in sets of ones and threes before requiring a spin by one position. Those who have done their colouring start to have fun at this point; you can soon set some challenges (below) to describe what is happening. Those who haven’t done any colouring yet have the advantage of colouring more cleverly. A really simple decoration (for someone needing to catch up, perhaps) requires a pair of stripes down each side of the paper, I suggest making these not quite symmetrical so the inks don’t work on each other to soften the paper. One Y10 class with whom I used flexagons found that tri-symmetric patterns within any face made it look as though they had even more faces than six. You might label faces and corners on a test model so as to better understand what is occurring. All faces reorient in moving from front to back, but some re-appear in a different rotation (no, not all; I’ll let you find out for yourself). A class that is going to investigate might well like to number their triangles in pencil and then rub out the pencil prior to colouring in at a later stage, post-investigation. Start with one of the positions where the thickness is uniform, having just cycled from a one-possible-flex to three-possible flexes. Starting there, show what you have; show two sides. do one flex and rotate the flexagon one position (60º) clockwise. You have just made a third side appear; each flex puts the old front to the back, so the first face vanished. Let the process of flexing appear to automatically include the rotation. Let’s call that flex-spin for simplicity. Let the audience get used to the idea that you have somehow three faces. We could actually make a simpler flexagon that did just this. I find one of these useful with a class that has heard already from their friends what they think is going to happen. When the audience has got used to the idea, show them a flex slowly, so they might be able to do it themselves. With a small group you can hand it over to a selected individual and talk him/her through it. After going slowly, let one one of the other three sides appear and feign surprise. I’ve done this so a blank white face appeared, or a face with an unexpected (pale) colour, or letters or numbers (“Class 5”, “Year 8” for example). Even year 12 can be sucked into “How did that happen?” surprise. Many assume that the second unknown face is the fourth one again (why? clearly there’s two-fold or three-fold symmetry since you’re playing with hexagons). I’ve had smart classes recognising that if there are five sides there must be a sixth. Actually, if the original manufacture is faulty so that triangles 1 and 19 are joined together the wrong way, there can be only fives faces and the sixth remains elusive - visible inside but never quite revealed – I’ve had a failure become a success that way. At any time when you’re pretty sure a flex should occur but it doesn’t ‘want’ to flex, use the Y/T position to adjust the folds, pushing with all four fingers, then open it up and try again. Sometimes the paper rolls over on an outer edge and forcing it to flex introduces a tear (a rip, not crying). I found that some inks softened the paper in a ruinous way. If you numbered the first 19 triangle 123123123123123123, then triangles 3n are all face 3. 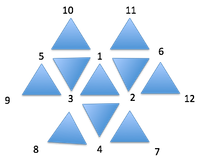 Similarly face 4 appears on the reverse of triangles 6n and 6n-1, face 5 appears on 6n-2 and 6n-3 and face 6 on 6n-4 & 6n-5. Triangle 1 needs no reverse, but the reverse of 19 does. The flex-spin repetition produces four possible cycles, through 123, 234, 125 and 136 (I think, I may have got the referencing confused). I drew (or tried to draw) a diagram to show this: each blue triangle represents a flex-spin cycle. Even our cleverest washing machine doesn’t flex and spin. Reading Gardner later, I have apparently re-discovered a ‘Tuckerman traverse’; Tuckerman³ was one of Stone’s friends first shown the original flexagon. Tukey⁴ and Feynman² worked out a complete theory of flexagons in 1940; anyone finding it is exempt from using this as a piece of coursework (or they’re cheating). On the other hand they might be deserving of another award, since it has not been published, Gardner says. 1 “Bob’s your uncle” is a saying in English, meaning ‘just like that”. I prefer wikipedia’s second explanation, that Lord ‘Bobs’ Roberts was a general in India, having him as a relative would have been convenient. The phrase dates from the 1930s, so it seems likely to me that a music hall comedian or magician used it; being pre-television, it strikes me as quite likely that usage spread without the etymology keeping pace. Urban dictionary says that Robert Cecil appointed his nephew Arthur Balfour as Irish Secretary; that fits with the meaning of “Hey presto, solution achieved” but the the printed use doesn’t fit 1887 when the first recorded use is fifty years later. 2 Feynman, Richard Phillips, American theoretical physicist working in quantum mechanics, superfluids and particle physics, Nobel Laureate in 1965. Ranked by Physics Words as one of the top ten all-time physicists (so you should have heard of him), if only of Feynman diagrams. Possibly history will call him the father of nanotechnology and or quantum computing. 3 Tuckerman, Bruce; theorist on development of groups (not maths, but management science) with five stages: forming, storming, norming, performing and (later) Adjourning/transforming (five or six?). I didn’t say it is the same Tuckerman - the one working with Stone was Bryant, not Bruce. Bryant studied topology at Princeton, discovered a Mersenne prime 219937-1 and was in the team that developed (the) Data Encryption Standard. 4 Tukey, John Wilder, is the probable (1977) author of the boxplot familiar to students of Y9 and upwards. He was (wikipedia says) the author of the term ‘bit’, a binary digit. In other fields his fame lies in developing the fast Fourier transform (FFT) method. He had an MA in Chemistry and a PhD in Maths. He may have been the originator of the term ‘software’ back in 1957. From Wikipedia ‘talk’, note he would have pronounced his name TOO-kee, not Tyoo-kee. There are many websites I did NOT look at, only those of Wikipedia and Martin Gardner.